the only astrological diary you need! Image printed on one or both sides. A useful cotton shopping bag, with long straps to fit over your shoulder. Made from ethically produced materials. For 1 - 5 items, post & packing is a flat £1.50 per order to UK/RoI addresses, and £3.00 to all other countries. For 6 items and over, per order, p&p is FREE to anywhere in the world. DIARIES: December & January – Diary orders will be despatched 3-4 times a week, by 1st class post. At all other times of the yearth I post these out about twice a week, by 2nd-class post, so they should arrive within 7 working days from ordering. 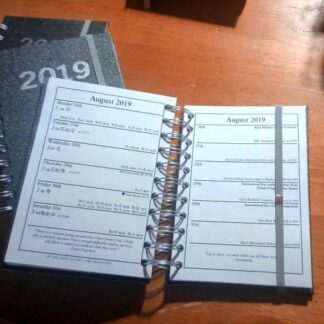 But please let me know if you need your diary by a certain date. T-SHIRTS, MUGS & BAGS: These are sent directly from the printing company; delivery is within 7 working days from order (may be delayed during the Christmas rush).